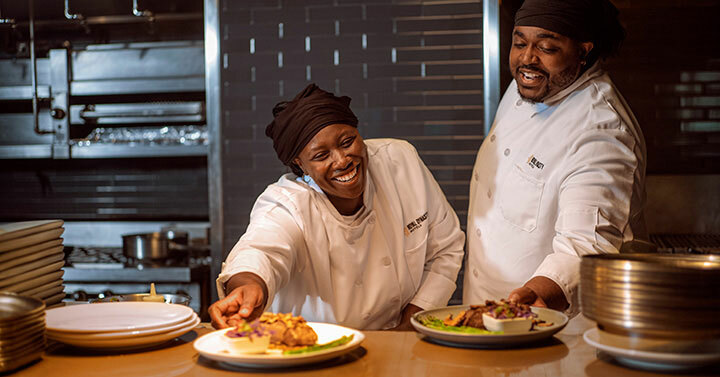 Our most popular food service and restaurant apparel carries the UniWear® label, an exclusive UniFirst brand manufactured in our ISO certified facilities. UniFirst HACCP/GFSI-friendly food service uniforms and service programs help ensure food safety and minimize cross contamination risks. Support your Good Manufacturing Practices (GMPs) with specialized food service clothing to more easily comply with food safety regulations. UniFirst's UniSafe® Service and Product Protection Process (PPP) provides portal-to-portal sanitization control for your employees' food service and restaurant uniforms. In addition to hygienic laundering and protection of food industry clothing, PPP provides documented, verifiable processing, and custom services such as poly-wrap deliveries. Scientific testing by an independent laboratory showed that our UniSafe® Service for food industry uniforms kills pathogens known to cause food-borne illnesses. Learn about our UniSafe Service and Product Protection Process. Download the UniSafe Service and PPP White Paper. Some of our most popular food service and restaurant apparel carry the UniWear® label, a UniFirst exclusive food service clothing line that's manufactured following strict ISO 9001:2008 quality guidelines to ensure the very best workwear features when it comes to quality, comfort, and durability. Enhance your business image with our custom emblems and embroidery for your company name, logo, and/or worker names. Employees outfitted with customized uniforms also become “walking billboard” advertisements for your business. You can rent, lease, or buy workwear, server uniforms, protective apparel, and more by using a value-based program that fits your budget. And with our coast-to-coast service capabilities, we can meet all your chef wear, wait staff, and catering uniform needs no matter what size your company or where your facilities are located. Browse our online uniform rental catalog and choose from our wide variety of food service, raetaurant, food processing and chef uniforms.